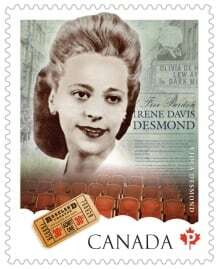 She’s often described as Canada’s Rosa Parks though technically Rosa Parks is America’s Viola Desmond. This civil rights icon refused to give up her seat in a whites-only section of a Nova Scotia movie theatre nine years before Parks’s famous act of civil disobedience on a racially segregated bus in Alabama. Starting in 2018, Viola Desmond will be the first Canadian woman to be featured on the $10 bill – this is HUGE! ‘It’s a big day for a woman to be on a banknote. It’s a really big day to have my big sister on a banknote’ said Wanda Robson. Wanda is now 89 and is one of main reasons we know about Viola, she kept her sister’s legacy alive; talking with people, giving interviews all over the country, and later writing a book about her sister’s story. Viola Desmond was born and raised in Halifax. She studied at the Field Beauty Culture School in Montreal, one of the few institutions that accepted black students, and went on to open Vi’s Studio of Beauty and Culture, a Halifax beauty parlour and shop that catered to black women. From there, she expanded her empire, founding the Desmond School of Beauty Culture and launching a line of products sold at shops owned by her graduates. On Nov. 8, 1946, Desmond, who was then 32, had some time to spare while she was waiting to get her car fixed, so she decided to catch a movie at the Roseland Theatre in New Glasgow. She sat in the slightly more expensive, and implicitly whites-only, section of the theatre. She was asked to move because the seats were more expensive and black people were only allowed to seat on the balcony. Viola offered to pay the difference, but was refused and was dragged out by force from the theatre and then arrested. Her charge? Attempting to defraud the provincial government because of the one-cent difference in the amusement tax between the balcony and floor seats. Desmond was released after paying a $20 fine and $6 in court costs. Viola’s fight didn’t end here, she hired legal counsel and appealed the charge in court — but she ultimately lost. Even though Desmond lost her court battle, her story and her vigilant activism through the Nova Scotia Association for the Advancement of Coloured People were important factors in the eventual abolition of the province’s segregation laws in 1954. But all the attention she received — much of it negative — took a serious toll on Desmond. She eventually divorced, shut down her business and left her home province for Montreal and then New York City in search of a fresh start. She died alone in 1965 at the age of 50 from internal bleeding. In 2010, 45 years after her death and 63 years after her conviction, Nova Scotia’s government posthumously awarded Desmond an apology and pardon. Other tributes include a university scholarship and a Halifax harbour ferry in her name. A commemorative stamp was also issued in her honour in 2012.